A staff member from Wushan county's vegetable science and technology demonstration garden takes care of the tomatoes in a greenhouse. Wushan county in Northwest China's Gansu province held the opening ceremony of 2015 Wushan Vegetable Fair on May 26. According to?local authorities, the fair was focused on developing an environmentally friendly and efficient agricultural industry and ensuring product safety. Themed on "promoting modern agriculture and increasing farmers?ˉ income", the fair took place at the Wushan vegetable science and technology demonstration garden. During the four-day fair, various activities were held concerning the development of vegetable industry, including a vegetable industry forum, agricultural products exhibition, promotion conference and investment environment briefing. Organizers of the event included the Gansu Agricultural and Animal Husbandry Bureau, and governments of Tianshui city and Wushan county. According to the Gansu Agricultural and Animal Husbandry Bureau, Gansu seeks to improve its vegetable quality safety regulatory system by popularizing biological and low toxic pesticides and increasing the pesticides utilization efficiency. 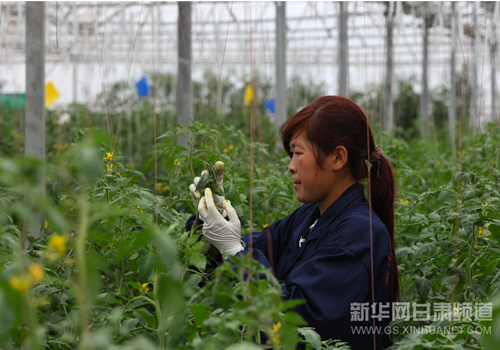 A worker checks on cucumbers at the greenhouse of Wushan county?ˉs vegetable science and technology demonstration garden. Wushan county is an example of developing efficient agriculture. Located in the southeast Gansu province, Wushan was honored as the national "demonstration of green agriculture", and "key county for vegetable industry." More importantly, it was awarded the "hometown of Chinese chives" by the national Ministry of Agriculture in 2005. The local government of Gansu has strived to develop Wushan into a vegetable export base in recent years. In 2014, income from the vegetable industry made up 48 percent of the net income of local farmers. By the end of 2014, the vegetable field covered 24.33 hectares of land, which produces more than 1 million tons of vegetables and coughs up an annual output value of 2 billion yuan ($320 million). Science and technology plays a vital role in the growth of the vegetable industry. Wushan science and technology bureau and agricultural bureau provide agricultural training and send technical engineers to tutor farmers regularly. 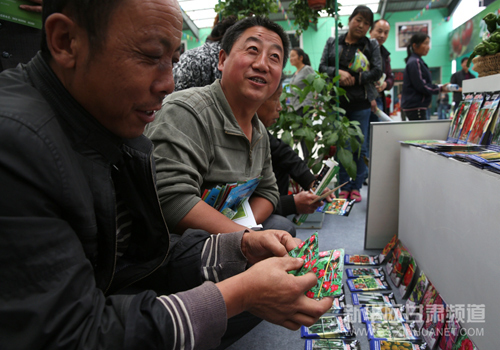 Farmers buy seeds at the 2015 Wushan Vegetable Fair in Wushan county, Gansu province, on May 26. Scientific plantation methods have benefited many farmers. One farmer, Guo Quangang, said, "Thanks to advanced technology, the yield and quality of my vegetable fields have all increased. Last year I planted 2,000 square meters of vegetable and gained more than 20,000 yuan. This year, with the better vegetable market, I am expected to earn 50,000 yuan from my vegetable fields." To bring the vegetable industry into full swing, Wushan has set up a batch of vegetable processing enterprises, including Wushan Jinlong Farm and Sideline Products Co. Processing companies also carry out strict safety tests for vegetables and vegetable products sold both in the domestic and foreign market. Wushan?ˉs 52 vegetable processing enterprises received 150 million yuan of annual output value in 2014 and generated $2.65 million in foreign exchange through exports.